Cancer claimed Grady Hatton Thursday at age 90. A crisp sig, until the end! 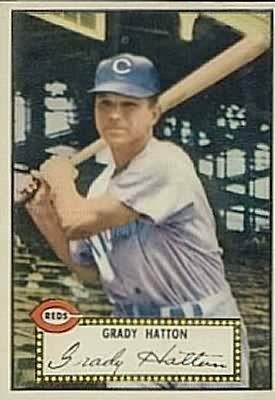 Hatton was a sure-thing signer. He added “1952 All-Star” on request. All I got was a crisp autograph when I wrote. The questions were ignored. Reviewing the archives of www.sportscollectors.net, I saw that I wasn’t alone. In 2004, Hatton wrote to one collector that he’d get in trouble with players if he answered questions. I met Hank Bauer at a 1980s card show. A bubbly Boog Powell loved chatting with him at an after-hours reception for card dealers. Powell would tell anyone anything. Bauer was more careful. No more worries about keeping confidences, Grady. Thanks for the signature. Sorry to hear about Grady. I had just sent him a letter on April 9 – seems like I have missed my chance. I called Hatton a few years ago to ask him about what it was like playing in 1947 amidst Jackie Robinson’s debut and he gave me the same answer. He was very polite about it, but he said that he feared being misquoted and upsetting other players.